This set of Instrumentation Transducers Multiple Choice Questions & Answers (MCQs) focuses on ” Force Measurement”. 1. Which of the following device can be used for force measurement? Explanation: Beams are used for force measuring applications, all other devices listed are used for measuring pressure. Explanation: Load cells are used for measuring weights of slowly moving bodies so that their weight will be uniformly distributed over load cell surface. 3. Which of the following can be measured using a Ring-type load cell? Explanation: Ring type load cell consists of a ring like an arrangement to which force is applied. They are used for applications in which measurement of small forces are required. 4. Which of the following arrangements are used in load cells? Explanation: Force applied to a load cell is measured using determining tensile and compressive components of strain. Strain gauges are attached to the surface of the load cell. 5. Which of the following represents correct relationship for strain in ring-type load cell? Explanation: (1.08 F R)/(E b t2) represents strain measured using ring-type load cell, in which F represents force applied, R represents radius of ring, E represents Young’s modulus of material, b represents axial width and t represents thickness of ring. 6. Which of the following conversion is correct for load cell? Explanation: Commonly load cell measure applied force using strain gauges, but in some cases, force is measured by detecting displacement, that is a force to displacement conversion. 7. Diaphragm element can also be used for force measurement. Explanation: Diaphragm elements act like flat springs in case of force measurement and can be used for measuring both force and pressure. 8. Which of the following statement is true for force? Explanation: Force can be described as a vector quantity, in which measurement of magnitude and direction of application is important. 9. Which of the following statement is true for diaphragms? Explanation: Diaphragm elements, being a small force capacity is used for measuring small forces only. 10. Load cells are primary transducers. 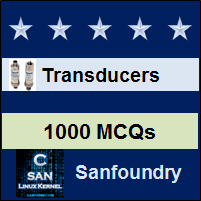 Explanation: Primary transducers are which converts measurand into mechanical quantities. Load cell converts measurand into strain or displacement which are mechanical quantities and hence load cells are primary transducers.